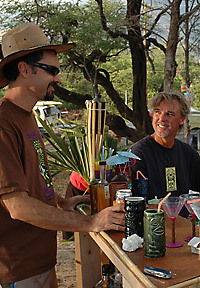 Having a party and need to make a large batch of Mai Tai's? 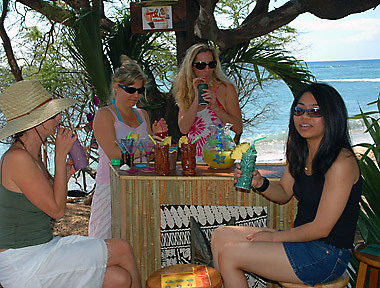 Here is my SECRET quick and easy Mai Tai recipe for those of us who aren't bartenders. Start with Trader Vic's Mai Tai Cocktail. It's ready to go with alcohol included. Pour into your favorite pitcher and add 1 can of Pineapple Juice. 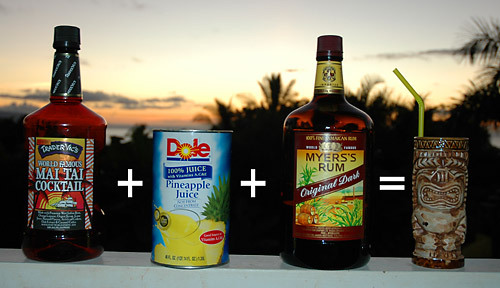 Because the pineapple juice dilutes the Mai Tai mix you can add 1/3 to 1/2 cup of light Rum. Pour over ice and add a float of Dark Rum. Pineapple wedges make a great garnish. Serve with a straw. Now wasn't that easy! Copyright ©2005 website design by Tradewind Graphics - All Rights Reserved.